Boyoung Lee received her Bookbinding and Gilding CAP(certificate d’aptitude professionnelle) conferred by the French Ministry of Culture and Education in 2009 after 5 years of studies at the “Paris l’école de Tolbiac ‘métier livre d’art where she trained in traditional bookbinding techniques. She returned to Korea in 2010 and opened her own studio, Atelier Reliure d’art’ (Art Bookbinding Atelier). Boyoung also participated in many exhibitions and had been working with individuals and libraries on the repair and restoration of their book collections which include valuable exhibits and artefacts. She also provides bookbinding lessons to students. 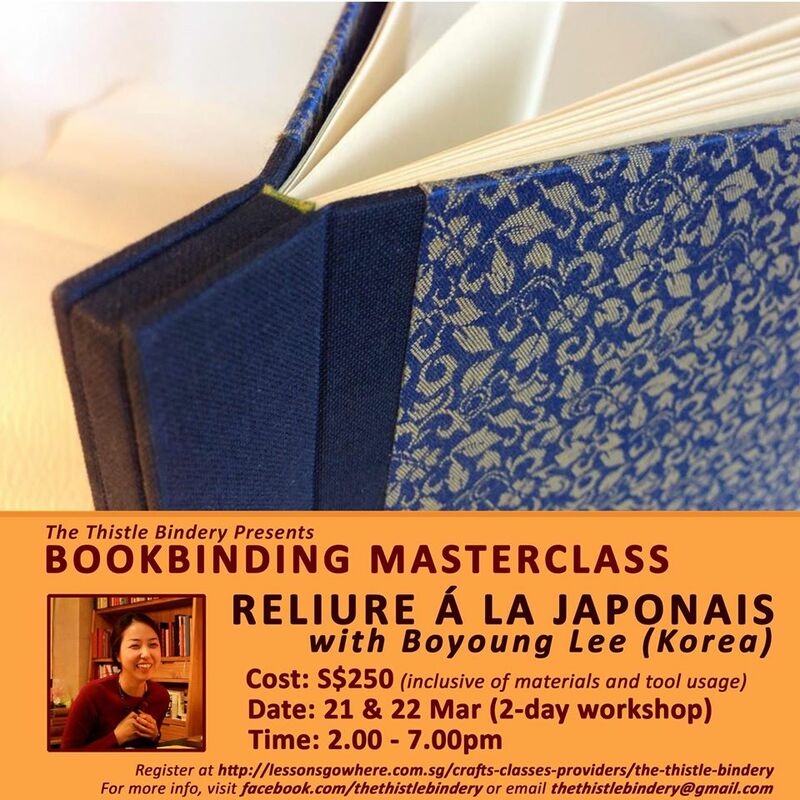 This 2-day workshop focused on the technique, Reliure á la japonais. It is an interesting French interpretation of Japanese stab binding technique. Instead of exposing the stitching, the binding is neatly encased with covers exquisitely wrapped with calligraphy mounting cloth. By the end of the masterclass, participants learnt to mount calligraphy cloth onto papers and covers, created a unique stab binding structure and found out more about how the Japonais fever in the 19th century influenced traditional French bookbinding techniques. Take a look at the photographs from the masterclass here. 5년간 프랑스 제본학교에서 전통바인딩기술을 익히고,프랑스 문교부주최 제본금박부문 CAP교원기술자격증 획득하였으며(certificate d’aptitude professionnelle).여러 전시회도 참가하였다. 2010년 귀국한 뒤, 현재 서울에서 공방(boyounglee atelier)을 운영하며 개인의뢰작업은 물론 도서관의 귀중본 보수,복원작업을 하고 있으며 학생들에게 제본을 가르치고 있다.